(Bloomberg) — Palladium rocketed through $1,400 an ounce for the first time, extending its precipitous rally despite signs that global vehicle sales are slowing. The precious metal, primarily used in the auto industry for catalytic converters, has surged more than 65 percent since the middle of August. The bull run has been driven by an acute shortage of immediate supply as car manufacturers scramble to get hold of the metal to meet more stringent emission controls. 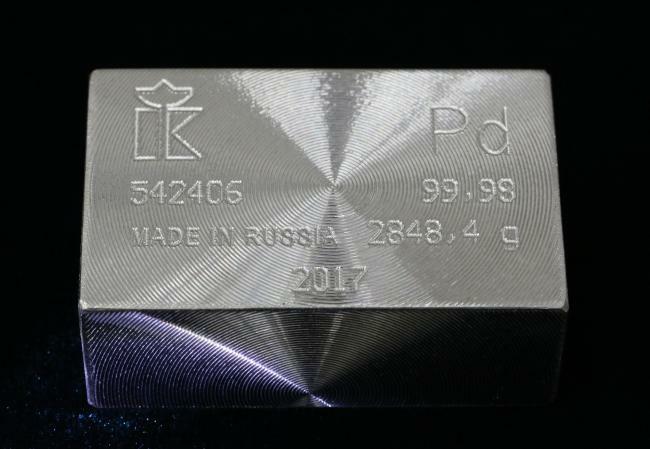 Palladium rose as much as 5.4 percent to $1,439.29 an ounce at in London. Investors appear to be shrugging off signs of automotive weakness in key markets, with annual car sales in Europe falling for the first time since 2013. China also declined last year and sales in the U.S. barely rose. The metal will remain in supply deficit for an eighth straight year, according to Metals Focus Ltd.
Palladium’s status as a by-product of mines in South Africa and Russia means production is unable to react to meet short-term demand despite the surging price. The lack of an obvious fresh catalyst to drive palladium higher has some analysts questioning whether the rally, which has resulted in the metal now trading more than $100 an ounce above gold, can be sustained. In the short-term, the rocketing price of palladium bodes well for the rest of the precious metals’ complex, according to Mike McGlone, commodity strategist at Bloomberg Intelligence. Other metals, such as gold and platinum, are likely to follow its parabolic gains when the potential for the U.S. dollar having peaked in strength is also factored in, he said.